'99 Wagon. Turbo Diesel engine, Deluxe interior, Deluxe Monsoon stereo, CD changer, Central tire inflation, Cruise, A/C, Driveline protection, Brushguard, Trailer towing package, Power mirrors, Power windows, keyless entry, Deluxe rearview mirror, Rocker panel protection, Gloss Black wheels, Heavy duty rear bumper, Runflat tire system, Heated windshield, Highway touring tires. 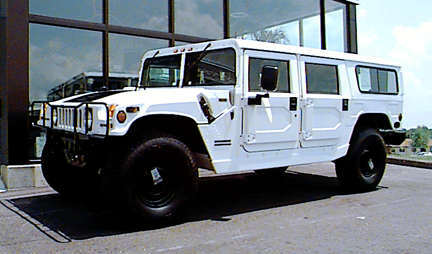 White H319.